Support SUNY Delhi's Women & Men's Tennis Teams by purchasing some gear! It's a great day to be a Bronco! SUNY Delhi Tennis - Gildan 7.75oz. Heavy Blend Hooded Sweatshirt. SUNY Delhi Tennis - 50% cotton, 50% polyester; air jet yarn creates a smooth, low-pill surface for printing; double-needle stitching throughout; pouch pocket; 1x1 athletic rib with spandex; double-lined hood with drawstring. Price includes 1-Color/1-Location Imprint. Imported. SUNY Delhi Tennis - Unisex Gildan 6.1oz Ultra Cotton L/S T-Shirt. 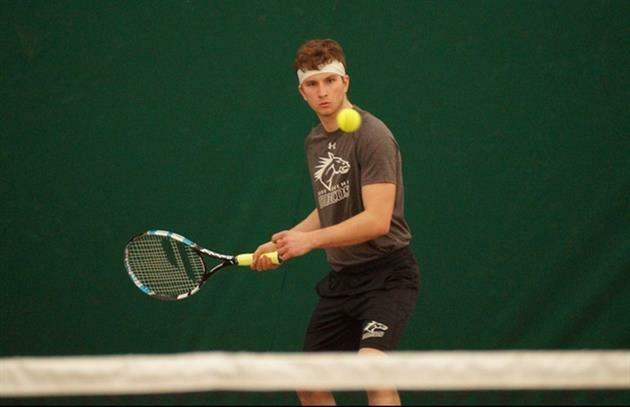 SUNY Delhi Tennis - Unisex 100% preshrunk cotton; double-needle stitching throughout; taped shoulder-to-shoulder; Ash is 99% cotton, 1% polyester; Sport Grey is 90% cotton, 10% polyester; Dark Heather, Heather Cinnamon, Safety Green and Safety Orange are 50% cotton, 50% polyester. Imported. SUNY Delhi Tennis - Unisex Port & Company® - Classic Sweatpant with Pockets. SUNY Delhi Tennis - Unisex Cozy sweats in our classic weight. 7.8-ounce, 50/50 cotton/poly fleece. Air jet yarn for a soft, pill-resistant finish. Elastic waistband with drawcord, open hem cuffs. Imprinted Logo. Imported.